One of the major improvements that rolled out with the launch of Destiny 2: Forsaken was the all new PvE/PvP hybrid game mode called Gambit. We enjoyed the mode an absolute ton while first playing it at E3 and have definitely enjoyed it since Forsaken launched earlier this month. Gambit is mostly a competitive PvP match where two teams face off against AI enemies to collect motes of light and store them in a bank. So the core gameplay is pretty typical Destiny 2 PvE fireteam fare. However, each team can drop special large ads on their opponents map, and even send one of their own as a ghost to harass the other team, for a more traditional PvP experience. Whichever player invades the other team gets a pretty significant buff, which allows them to enjoy all the fun of racking up a massive PvP killspree with a bit less skill required. If you joined the last free Gambit weekend, this one will be pretty similar. All four Gambit maps will be open and the weekend will run from 10am PDT on Friday through to 10am PDT on Sunday. All 4 Maps. This Weekend only. 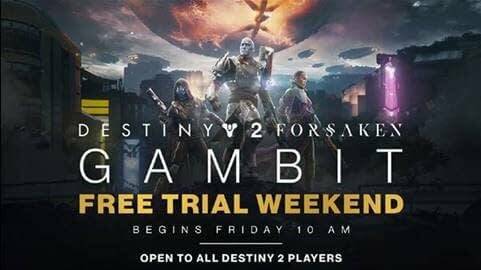 If you’re interested, you may also want to take a gander at the new Gambit Free Trial trailer below. Destiny 2: Forsaken launched on September 4th, 2018 for PS4, Xbox One, and PC.